The newspaper Algemeen Handelsblad evening edition Monday 19 November reported that according to a telegram from Bastia, Corsica fire broke out in the cargo on board of the Dutch steamship Rijperkerk. She belonged to the Holl,-Oost-Afrika Lijn en was underway from Port Saïd towards Marseille. She was load with several tons peanut and some other merchandise. Wireless signals for help were send by the ship which arrived after some hours at the new wharf at Bastia. Saturday evening was the fire extended although the unloading of the ship was continued. Shortly afterwards arrived the Dutch cruiser Hr.Ms. Tromp (1) which was cruising in the Mediterranean and assisted with the fire fighting-work. All efforts were without success and within short time was also the superstructure at the fore end burning. The destroyer No. 96 tried to sink her with gunfire. At the moment of publishing the newspaper was the Rijperkerk lying upside down showing her screw while the bow was submerged and the fire still going on although less fiercely. The photo was published in the Dutch magazine De Prins dated 8 December 1923 page 276. The newspaper De Sumatra Post dated 20November supplied different details. This newspaper reported that the Tromp sunk her with gunfire after assistance of her and two tugs with the fire fighting-work were without sufficient results. She was underway from Port Natal and Mombasa (British East Africa) underway with a cargo of koprah from the Indies destined for Marseille and London. The mail was saved and now on board of the French steamship Bonaparte. The Rijperkerk was a rather new ship measuring 5,900 tons and belonging to the Nederlandsche Stoomvaart Maatschappij. The edition dated 20 December reported however that the Rijperkerk was sunk by a French warship with 10 gunshots and not by the Tromp. The new and reliable source was the newspaper Nieuwe Rotterdamsche Courant. The newspaper Het Vaderland evening edition dated 20 November reported that she was assured for more as 90.000 pound sterling. Although considered not to be entirely lost the damage was severe. The cargo consisted of copra, tobacco, rubber and ivory. In the evening edition dated 28 November were more details supplied by one of her crewmembers K. W. Van Beaumont. She was underway from the African East coast where in several harbours merchandise was loaded for Marseille, London, Antwerp, Amsterdam, Rotterdam and Hamburg. On Friday 16 November 9.00 o’clock were they near Bastia when a fire was discovered and the crew started to transfer the cargo mainly consisting of peanuts, cotton, hemp and sim-sim. The transfer however caused an inclination and it was decided to throw a part of the cargo over board and a merchant ship at Bastia was wireless signalled for aid. When the asked lighters and so never appeared was decided to set the whole cargo over board. Finally the ship was allowed to enter the port of Bastia at 17.30 o‘clock. French infantry assisted with the fire fighting-work but in the meantime broke fire out in cargo hold 2. The next day arrived the Tromp at 15.00 o’clock and while assisting with her strong pumps started 100 of her sailors with unloading the cargo holds no.’s 4 and 5. In the afternoon were 3 cargo holds in fire and were the fires below the boilers extinguished to prevent an explosion. At 17.00 o’clock decided the commanding officer of the Tromp to leave the harbour caused the extent of the fire. Earlier were electrically holes pierced in the hull of the Rijperkerk near to the waterline to scuttle her and the Tromp was asked to shoot in the bow. However her guns were to heavy and the harbour too small to manoeuvre so she steamed outside. The French destroyer Chasseur No. 86 which was lying for some days at Bastia shot with her 7,5cm guns 6 times at the bow below the waterline intending to sink her prow causing her aft ship coming upwards while chains keep the ship to the wharf preventing her capsizing. On Sunday was also cargo hold no. 4 on fire and form no.5 coming smoke. Two tugs coming from Livorno pumped her full with water and she sink at 09.00 o’clock in 8-9 metres deep water inclining to port board. Bridge en superstructure were totally destroyed. The newspaper Limburger Koerier dated 20 November said that she was sunk with 10 gunshots by the French destroyer No. 93 causing her turning over with the screw visible and the bow submerged. 1. She was later salvaged, sold to Germany and taken into service in 1924 as the Targis for the Roland Linie. 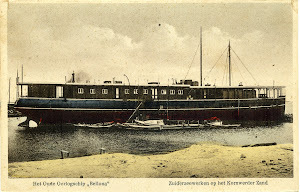 Owned by the Vereenigde Nederlandsche Scheepvaartmaatschappijen (VNS). According to the website www.arendnet.com was her call sign PRNL and was she launched in 1915 as the German Wolfram and handed over by the yard of Frerichs&Co, at Einswarden with building no. 263in 1917. In 1919 handed over to the V.K., became she in 1920 the Netley Abbey and in 1920 property of the VNS as the Rijperkerk. Salvaged in 1925 and sold to Germany as the Targis. 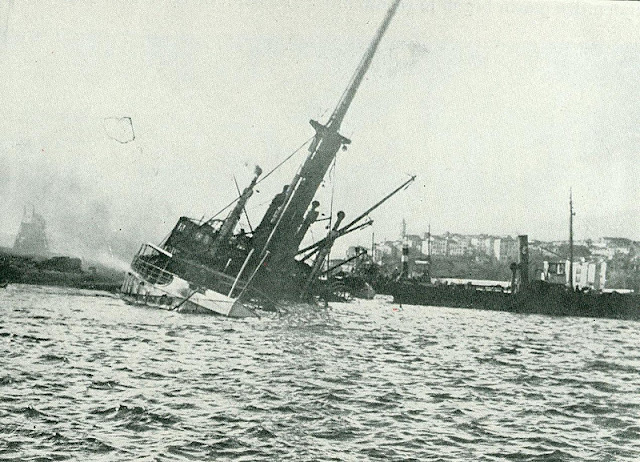 Sunk on 18 November 1930 after an explosion forewardd. With a net tonnage of 9,630, a gross tonnage of 5,985 tons were her dimensions 130,96 (0ver all) x 16,76 x 8,81 (hold) metres. The 4 cylinder engine manufactured at the yard supplied 3,200 ihp allowing a speed of 12 knots. 2. The armoured cruiser M.H. Tromp often called an ironclad and not to be mistaken with the famous light cruiser of the Second World War.